designcovers has no other items for sale. A++ Seller ,fast shipping and recommended to all. Exactly as described, excellent packaging and quick ship. Thanks! Great seat covers for the $!!! 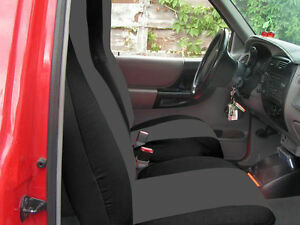 Great seat covers for the money! I don't usually write reviews, but feltee inclined to do so because I am impressed with the fit of these covers. Fit like they were made for my truck. Material seems to be pretty decent as well. We'll have to see how they hold up, but first impression is that they were well worth what I paid for them! Also, installed in under 30 minutes. Fits a little loose. Not as heavy as my previous seat covers but they look like they will do the job. These were for a 2000 Ford Ranger pickup. For $89 you’d expect a snug fit, not so. Still good quality and fast shipping. They fit a little loose but it made my old truck feel new.